Update: There are a lot of rumors swirling about this group's involvement with the site, and until I get a document or something clearer in my hands, I'll freely admit that I don't exactly know what their connection to it is (some even say this group may be unrelated to the awful landlord). Still, I think can revise this post by simply saying "If these are the Pinnacle guys you've read about, then . . ."
If you've walked by the corner of Eastern Parkway and Franklin in the past week, you've probably noticed a pair of giant vinyl banners from Pinnacle Realty covering the the Crow Hill Community Association murals at the corner lot (341 Eastern Parkway). 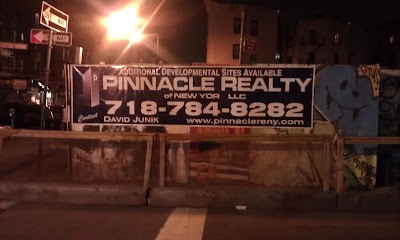 Many people on the Avenue have hoped to see this site developed for a long time, but the appearance of Pinnacle's signage is NOT good news. For starters, someone in the know says that Pinnacle doesn't actually have any relationship with the current owners or prospective buyers, and have just thrown up their signs illegally in an attempt to attract buyers for other properties in the neighborhood. While ILFA hasn't yet been able to confirm this with Pinnacle, such bad behavior would be no surprise coming from one of NYC's worst landlords. A rapacious, unscrupulous company that took out massive mortgages on properties in rapidly changing low and middle-income neighborhoods before the crash, Pinnacle has been sued for using illegal intimidation and harassment to drive rent-regulated tenants from their homes, often through such nefarious tactics as shutting off heat and water, "losing" rent checks, and failing to conduct basic maintenance. Ben Sacks of StableRenters, a startup that aims to inform potential tenants about the trustworthiness of NYC landlords, suggested what ILFA thinks is an effective analogy: If a teacher strikes a child in school, they don't just lose their job, but they're barred from ever working with children again. Pinnacle, despite routine attempts to destroy the lives of law-abiding New Yorkers, on the other hand, gets to keep running around wreaking havoc. (Sacks notes that he was inspired to create StableRenters in part because of the misbehavior of landlords like Pinnacle). Recently, it seemed that Pinnacle might have been reaping what they sowed, as the crash made many of their redevelopment plans untenable and has forced them to sell or lose several of the properties where they hoped to double (or quintuple) rents. Like Freddy Krueger, however, they just won't go away, and now they've most likely broken the law by putting up a banner illegally. Even if they are involved with the lot, we don't want them hanging around Franklin making another mess. How to respond? Well, they've got their number right on that sign - 718-784-8282. Why not give them a call and ask them to take that banner down. While you're at it, let them know that their typical tactics will meet with stiff resistance in Crown Heights. As a reader below notes, you can also call 311 and register a formal complaint about illegal signage. I recommend calling 311 and complaining about illegal signage. I think this is a different Pinnacle, these guys are brokers of industrial property and development sites. I don't believe they are involved with residential at all and don't believe they are landlords. If they are the same entity, they likely have different entities to minimize their liability. Among their Brooklyn development sites is this one in Prospect Heights. A large, prime site! P.S. They are obviously not fans of fixed neighborhood borders. Sterling and Nostrand = Prospect Heights? Having tried to dig around a little more, I've gotten nothing but conflicting rumors. Most people say these are the same guys (or connected), but some say no, some say they're involved in a sale of the site (though it must be pending, because it hasn't been posted yet on pshark or the other real estate sites), some say they've got nothing to do with it. More to come, obviously, once this gets sorted out. Pinnacle has the listing. The agent's name is David Junick. What Does a Just Crown Heights Look Like To You?